We’ve been doing this for four decades now. 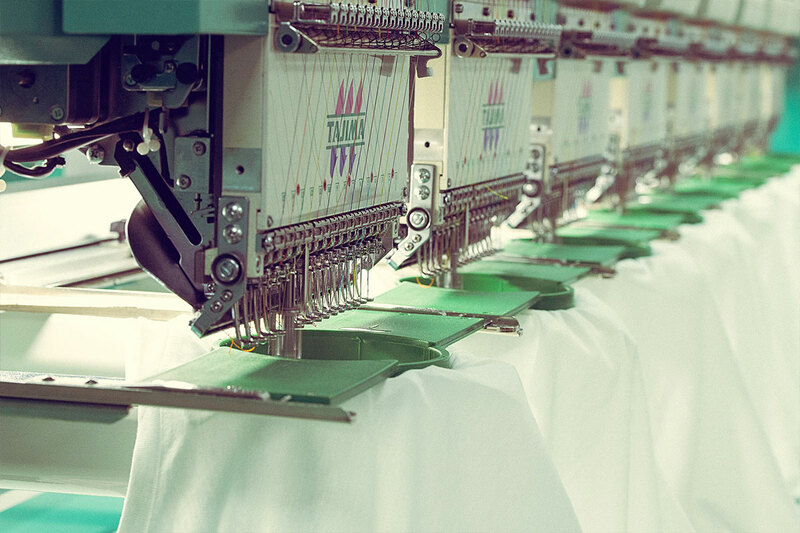 Each of our state-of-the-art machines can print 600 garments an hour and we’ve got the process down to a fine art. That means colour faithful prints that won’t fade, that are soft to the touch and long-lasting. Screen printing involves applying ink directly on the garment (and you can read more about our inks here). We digitally transfer your choice of image to a very fine fabric mesh – or ‘screen’ – that has been stretched on a frame. The areas that aren’t to be printed are blocked off so that the mesh behaves like a stencil. Applying pressure using a squeegee, we wipe the ink across the screen and, as it finds its way through the unblocked pores on the mesh, the chosen colour of the design appears on the material. We can print up to 12 colours on our state-of-the-art MHM machines or use skilled hand printers for large format printing. Our Ink Department has hundreds of Pantone colours already mixed off the shelf and, as each colour requires its own screen, we house more than 3000 screens at any one time. The process is repeated to build up to the full-colour palette of the artwork, and the result is your design in all its technicolour glory. By the way, we have a low minimum order requirement. Click here to discuss. The right ink depends on your choice of garment and design. We only use the best plastisol, discharge and waterbased inks, and can offer clients speciality techniques including metallics, glow-in-the-dark, thermochromic and reflective inks. Nothing is too challenging for us. This is the go-to ink for screen printing that produces bright colours on all fabrics. When heated, plastic particles in the liquid plasticizer turn it into a highly viscous gel. Just a thin layer of plastisol ink printed onto the garment produces a slightly raised effect to the touch. It’s easy to match Pantone colours with plastisol for a vibrant look that’s faithful to the artwork. 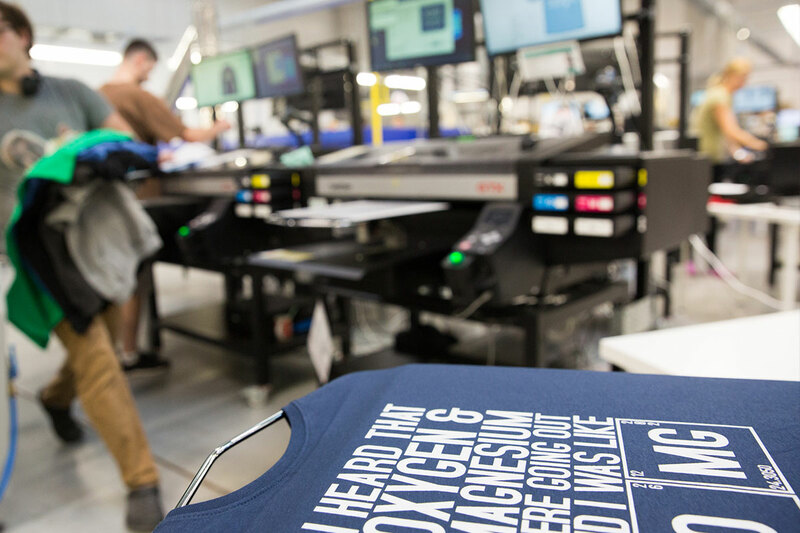 Discharge printing involves adding water-based inks to “dischargeable” dark coloured garments, producing an ultra soft print with vivid colour. The discharge inks are mixed with an activator and heat cured, reducing the original dyes in the garment. Discharge ink works best on dark, 100% cotton and natural fibre garments. Some colours work better than others. There are two colour modes for print reference: RGB (Red, Green, and Blue) and CMYK (Cyan, Magenta, Yellow and Key/black). RGB offers a wider, more vibrant range of colours than CMYK – a range of colours that you see on your computer monitor that aren’t achievable in print. We work in CMYK when producing artwork for screenprinting, with attainable colours. Metallic inks – specifically gold and silver – add instant drama and are a popular choice for fashion brands and promo items. The process is the same as standard screen printing except using just gold and silver inks and no overlay treatment. Metallic ink is slightly thicker, so the artwork should be straightforward and not detail orientated to achieve the best effect. Unique foaming agents will make your artwork stand out, 3D style. We mix puff additive into plastisol ink and screen print normally. It’s during the curing process in the tunnel dryer that the puff additive reacts to the ink and expands. We can apply this raised effect to all of your design or just specific areas. To achieve a lurid lime green luminous look we mix the ink with phosphors – special chemicals that absorb energy and re-emit it as light. We apply that ink to a base of bright white ink that has had a translucent treatment. By daylight, the design appears off white, but after it’s been charged by light it glows brilliantly. Thermochromic inks are temperature sensitive compounds that temporarily change colour as the ink warms or cools. Effective from anywhere between -10 and 70°C, the ink is coloured at room temperature and becomes lighter when in contact with warmth. This cleverly reveals colours, handprints or designs. This special pale grey ink can reflect bright light – like car headlights – and is often used by us for clients wanting high-vis workwear and sports apparel. The process is the same as standard screen printing, and reflective ink works well on a wide variety of garments. The added bonus is that it’s durable too. Got a question about ink? We are here to help. You can’t screen print perfectly on every garment, and that’s when embroidery comes into its element. It’s a stunning way to showcase your logo on jackets, hats, bags and workwear – it’s particularly durable and looks and feels premium. For this method, the artwork is printed straight onto the garment using a specialized inkjet printer. As it’s a digital process, the result is a higher resolution image and sharper print. It’s a growing part of our business at Fifth Column. 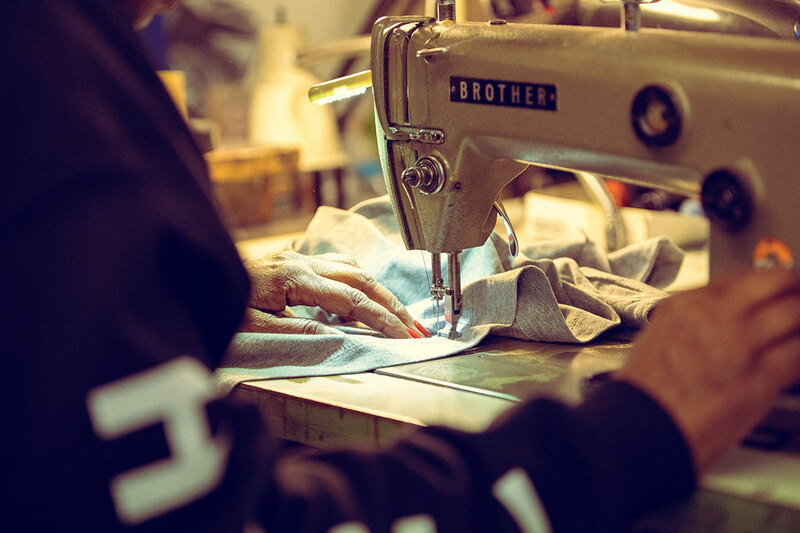 After the printing is done, it’s time for the finishing touches to get your garments retail ready: custom labelling, hem tagging, poly bagging and applying stickers all help you put your mark on the product and make it look professional.